The Summer School is primarily intended for PhD students. The origin, evolution and architecture of magmatic plumbing systems may be studied by a wealth of different methods, including petrology, geochemistry, geodetics, tectonics, seismology and structural mapping of exposed outcrops to name a few. 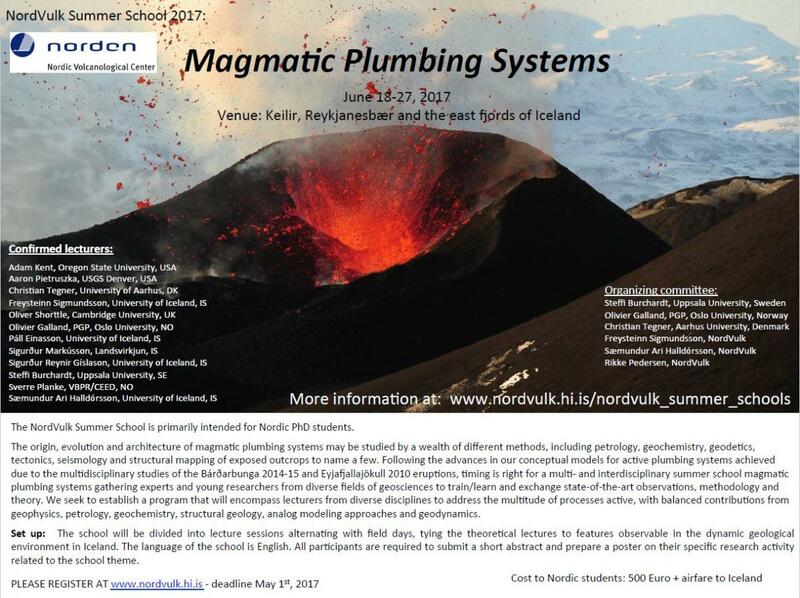 Following the advances in our conceptual models for active plumbing systems achieved due to the multidisciplinary studies of the Bárðarbunga 2014-15 and Eyjafjallajökull 2010 eruptions, timing is right for a multi- and interdisciplinary summer school magmatic plumbing systems gathering experts and young researchers from diverse fields of geosciences to train/learn and exchange state-of-the-art observations, methodology and theory. We seek to establish a program that will encompass lecturers from diverse disciplines to address the multitude of processes active, with balanced contributions from geophysics, petrology, geochemistry, structural geology, analog modeling approaches and geodynamics. Set up: The school will be divided into four main sessions, where lectures will focus on specific topics (see program overview below). Four field days aim to tie together the theoretical lectures to features observable in the dynamic geological environment in Iceland. The language of the school is English. All participants are required to submit a short abstract and prepare a poster on their specific research activity related to the school theme. June 18: All participants meet at the school location for dinner, a short introduction and practical information. June 27: Departures from Keilir, close to Icelands International airport – all participants are responsible for their own arrangements. Organizing committee: Steffi Burchardt, Uppsala University, Sweden; Olivier Galland, PGP, Oslo University, Norway; Christian Tegner, Aarhus University, Denmark; Freysteinn Sigmundsson, Sæmundur Ari Halldórsson, and Rikke Pedersen, Nordic Volcanological Center (NordVulk), Institute of Earth Sciences, University of Iceland. Registration and fees: Deadline for application is May 1th, 2017. An abstract is required to accompany all applications, as the participants are requested to present their own work on a poster at the Summer School. There is a maximum of 35 students admitted to the course, with a number of places reserved for Nordic participants. All participants are required to pay a registration fee of 500 EUR (non refundable), which covers tuition, course materials and transport during field trips. Furthermore, all participants must cover their own travel to and from Iceland, as well as accommodation in Iceland after the school (if required). For Nordic participants the cost of hotel accommodation and meals during the school is all covered by NordVulk. Students from other countries need to cover the additional cost of 800 EUR for hotel accommodation, fieldtrips and full boarding. Venue: This NordVulk summer school will initially be hosted at Keilir, situated at an old US airforce base at the Reykjanes Peninsula, close to the town of Keflavík. Following the intial three lecture days, we will all transfer to the East fjords of Iceland for field trips and the final fourth lecture day on the way back to the capital area. The school closes at the venue Keilir, close to the international airport on June 26th, and participants may plan their departures on or after June 27th.